Some parrots fear nothing — even the tiniest birds challenge huge rivals over territory. Other birds fear almost anything — falling or flapping in panic if a shadow crosses the ceiling. Some parrots fear nothing — even the tiniest birds challenge huge rivals over territory. Other birds fear almost anything — falling or flapping in panic if a shadow crosses the ceiling. Caution and fearfulness ensure survival in the wild. In captivity, fear contributes to the following: biting (the “fight" part of the fight-or-flight response); redundant calls; thrashing; falling; inability to regrow repeatedly knocked-out wing or tail feathers; and even feather-chewing. While young parrots learn more quickly, even a mature bird’s behavior changes as new responses appear and are reinforced into habits, and old behaviors become obsolete. Every parrot goes through periods of trying new behaviors. By the time he’s six months old, a healthy parrot is curious, active and exploratory. If a bird isn’t curious and doesn’t develop some sense of independence during the first year, he’s at risk of developing behaviors that progress beyond caution to fearfulness. In unfamiliar or challenging situations, a wild parrot’s first instinct is to fight or flee. Companion parrots cannot do that. A fearful bird might bite a human, cage or perch; throw itself to the floor or cage bottom; or improvise behavior intended to replace the option to flee. These responses can easily be accidentally reinforced. Whether the response is to bite (fight) or escape (flee), once a behavior has been repeatedly reinforced, it becomes a habit. Fledgling parrots that have their wings severely trimmed before learning to fly may not develop timing and balance needed for active play. Nails and wings trimmed too short in a young parrot — combined with perches that are too large or too hard — can lead to frequent falls. A parrot repeatedly knocking feathers out is at risk for developing fear responses associated with pain, feather cysts and an inability to regrow those feathers. 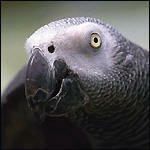 If your parrot is partaking in repeated efforts to knock out his feathers, your avian veterinarian should evaluate him. A parrot with new wing feathers growing in becomes protective of his wings and will avoid situations that stimulate flapping. He may protect himself from pain by refusing to come out of his cage, because he can fall easily. His preference to avoid handling should be respected. As he becomes even more evasive, he might automatically jump or thrash when he sees a human. This sets up fear of falling and fear of humans. As strategies to restore confidence progress, you might sometimes trick your shy bird into choosing to come out by removing the cage tray and grate and turning the cage upside down. Like most baby animals, young parrots have a little clumsiness to them. A cage that is too large or difficult to climb can also contribute to repeated falls. An overly cautious parrot might gradually become less interested in diverse activities and more easily frightened. Adjust: Generate different responses by using different stimuli. Sometimes elements are adjusted in one direction, sometimes the other. Reinforce: Reward new behaviors so that they become habitual. Most programs require readjustment — gradually establishing small changes to achieve long-range goals. Several cycles of evaluation, adjustment and reinforcement may be necessary to bring about improvement. However, in many cases, fearful behaviors can be successfully replaced with other behaviors. In addition to a safe, stimulating environment, companion parrots benefit from early patterning and socialization, which induces cooperative interactions, such as step-ups and towel play. If your parrot learns early that the towel is a cozy, safe haven, then the towel is always available to return a sense of security if your bird becomes frightened. Some parrots don’t tolerate physical contact with humans. Pattern these birds with eye games, body language games and other types of passive play. Redundant silliness is important here. Eye games include: mimicking each other’s blinks, peek-a-boo or always keeping one eye closed. Body language games include: crouching low or covering your head; hiding hands; hiding face; never looking directly at your bird; freezing absolutely still at an unexpected moment; or mimicking your bird’s body language. Sound games include: mimicking, tapping from across the room or calling softly around corners. Other interactive games include drop-the-toy-and-pick-it-up or letting your bird steal toys (such as specially designed bird-safe buttons or jewelry) from you. If your bird will take food from humans, give him as much warm food — a parrot’s equivalent of comfort food — as possible. Find a cooperative human, pet or bird that loves to be hugged, touched and petted and demonstrate these joys for your bird. This stimulates competition for human attention. Outings can stimulate attitude changes toward familiar humans in unfamiliar territory. Sometimes just taking your bird for a ride generates noticeable improvement—even if your bird never leaves his carrier. Your bird will enjoy new, enhanced experiences and — when he comes home safely —his sense of security will improve. The development of a confident relationship with even one human can be a breakthrough for a fearful bird because he might then develop more confidence in all areas of behavior. Fearfulness in companion parrots can be so troubling that blame and guilt plague human relationships around the bird. Sometimes humans blame themselves. Sometimes they blame their children, their parents or their in-laws. Sometimes, they blame the source from which they got their bird. Guilt and blame don’t contribute to your bird’s successful adjustment but rather adversely affect human caretakers' abilities to respond successfully. These emotions are best replaced in the human behavioral environment with attention, forethought and consistency. You can resolve to respect your bird’s sense of self, even if he’s shy and has a cautious sense of self. You can sensitively work to include your bird in as many side-by-side, passive activities as possible. It is possible to love a shy bird because this special gift is a necessary component in the survival of all parrots.